U.S. cell phone providers are facing increasing criticism they are dragging their feet on restoring cell service in Puerto Rico while Mexican-owned Claro has now successfully restored service in 28 of the territory’s 78 municipalities. Claro Puerto Rico, owned by Mexican billionaire Carlos Slim’s America Movil, has dramatically outpaced AT&T, T-Mobile, and Sprint in getting their damaged cell phone facilities back up and running. Claro is Puerto Rico’s second most popular cell company behind AT&T. “Claro is the only one with service here,” Francisco Portales, 47, a customer of privately held Puerto Rico-based network provider Open Mobile told a Reuters reporter while waiting outside the Claro store in Fajardo hoping to buy a phone. The FCC’s latest update on Tuesday reported about 88% of Puerto Rico is still without cell service, but the agency does not break down network repairs by carrier, and American providers have declared their specific restoration plans to be confidential. 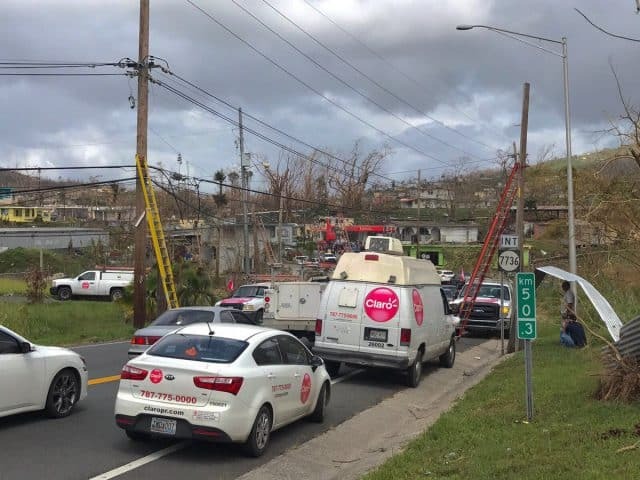 While AT&T complained the lack of commercial power remained its biggest problem, Claro said it had pre-positioned generators, diesel fuel, battery backups, and vehicles 72 hours before the hurricane hit, which appears to have made all the difference in restoring service. Claro is not taking advantage of its position as the island’s most reliable post-hurricane carrier, allowing customers of other providers to roam on its network where a signal is available. That may be all the good publicity Claro needs to win over new customers after the hurricane damage is repaired. Mercedes Saldana, a 54-year-old school cafeteria worker and Sprint customer is just one of many now searching shops for a Claro prepaid phone. Customers unwilling to switch carriers and won’t roam may have long travel times ahead of them to find a signal. 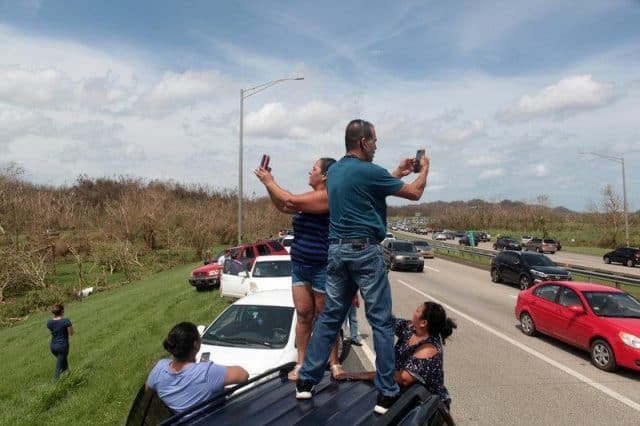 Luis Pacheco, 64, was planning to drive with his wife to Canovanas — 30 to 40 minutes west — in hopes of finding a cell signal to text his daughter in California. That is the nearest community where AT&T has a signal at the moment. Before the storm, AT&T dominated Puerto Rico with a 34% market share, followed by Claro Puerto Rico with a 26% share. T-Mobile was third with 19%, Open Mobile has 11% and Sprint 10%. Verizon Wireless has no network facilities in Puerto Rico, but travelers with Verizon phones are granted roaming access on Claro’s network. I had never heard of this company, being a white man from Boston, but I would like to see companies like this come into the U.S. and take over. So long as they can beat the prices of AT&T, Verizon and Sprint (which should be pretty darn easy), then they could stir up the market. I now live in Naples Fl., which Irma’s eye passed over at a Cat 4 hurricane just 3 weeks ago. In the 2 weeks following this, there were practically no cell towers in use. I have a Trac phone that I only use for emergencies, but in this emergency, it was nearly useless. At 4-5am, I could get a very weak data signal and maybe get a text message out, but it was difficult or impossible. Someone I live with had a Verizon phone that didn’t work at all. I would love to see a foreign carrier with lower prices dislodge these big-greed companies. Give me one hungry foreign company for any 10 fat, lazy and greedy American companies any day. That is not actually correct.. If you actually check them out, the companies that own sprint is owned by softbank.. which is Japanese.. and Tmobile is owned by 67% by Deutsche Telekom, which in turn is a sub-company of softbank.. So, both are mostly owned by companies out of Japan.. AT&t and Verizon are the only two that are American.. While I will agree that they could probably do more to get things going, you have to consider that as of 6 days ago, ” 90.3 percent of the island’s 2,671 cellular sites were not functioning.”.. Which means that, considering Verizon has NO cell towers down there (Verizon customers run off of Claro towers), that it means that Claro does not have many towers down there.. Being one of 4 carriers, it they had as much stake in towers as the rest of them, that number would be at least 25% working if he did..
Plus, the main carriers are probably still dealing with the aftermath of the damage in Florida, which Claro does not have to deal with.. That would leave the main carriers even more short handed..
Add in “Puerto Rico Electric Power Authority reported that nearly 100 percent of its customers were still without power”.. It makes it much harder to get things working, when there is no power.. and you can not run cell towers off of generators indefinitely.. I bet that once the electric company starts getting power on, things will start coming up much faster.. Correction to the correction: Deutsche Telekom isn’t owned by Softbank. Claro does appear to be a legitimately solid mobile carrier though, and not just in PR. Family used their Nicaragua branch when in that country on a mission trip. H+ rather than LTE where they were, but that could’ve just as easily been due to phone limitations rather than anything on the network. I also find it interesting that Claro (CDMA, I assume, since Verizon roams on it) wasn’t getting picked up by Sprint roamers. That said, Sprint would need to push a new PRL to allow roaming on Claro if they didn’t have it before, and you can’t push a PRL from your own network when your own network is down. I just looked up some new info, and it seems that part of the problem with the towers being down, is because of theft.. “Its crews are trying to get generators to cell sites though it said that stolen generators and fuel have made security a concern.” “After an effort was made to get the diesel, the drivers to transport it and the security measures to break through and carry fuel to the towers, they are stealing it and cutting the fiber.” There is also comments about theft of copper, among other things too.. They are denying that, but, if you are stealing generators, fuel, cutting fiber, etc.. You can not tell me no one is stealing copper too. I was probably in the middle of reading that sentence and the phone rang or something, and I missed the last half, leaving the first part.. “Japan’s Softbank, which owns Sprint, and Deutsche Telekom, which owns 67 percent of T-Mobile, “, which is where I got that.. It kind of did not make sense because I thought that it was a German company.. which it is..
Just did a bit of research and apparently Claro switched their network to GSM/UMTS/LTE awhile back, away from CDMA, so roaming on Verizon stopped at that point. Verizon now roams on Open Mobile, which looks like it’ll merge with Sprint in areas that it serves at some point. Guess that explains why Sprint can’t roam on Claro. Surprised that neither AT&T nor T-Mobile have set up roaming with Claro while they get their own networks up…no wait, I’m not, because that would probably cost those carriers a boatload in roaming fees.